Relive the days of Frank Sinatra, Dean Martin, Joey Bishop and Sammy Davis Jr. in this popular and entertaining Las Vegas tribute show, The Rat Pack is Back. It’s Vintage Vegas at its best. Relive the sounds of Vintage Vegas, enjoy a live orchestra, laugh to on-stage humor which livens up the mood, see Frank Sinatra impressionist looks just like Old Blue Eyes, and enjoy table service with a drink while you watch the show. 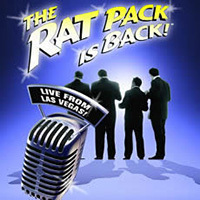 Rat Pack is Back proves Old Vegas is here to stay.